Welcome. Shinseikai Karate is happy to introduce a new format for our International Homepage and member web sites. We are very proud to establish this new format allowing visitors quick, easy access to Shinseikai and its Dojos located in Japan, Italy,Srilanka,Iran and Canada. Shinseikai has gone a long way since its official formation and we look forward to promoting the true Budo Spirit. Although our organization is small we train hard to insure that our students are competent with all aspects of Martial Arts: Full Contact Karate, K-1 style Kickboxing and Jujitsu! We also offer weapons training to complete a foundation that is true to the Budo Spirit. The future looks brighter and brighter for our relatively new organization as we move towards Internationalization. 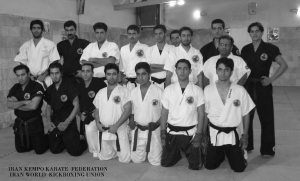 But our concern is not the size of Shinseikai Karate but the dedication and quality of its members. Our desire to promote only the most qualified instructors means that our growth will be slow but solid. Our future lies not in the size of our organization but the honor and competency of its Instructors. Rather than concerning ourselves with how many students and Dojos are under our affiliation, Shinseikai dedicates itself to creating quality fighters with a humble disposition essential to the Budo Spirit. We welcome all who wish to join us in promoting the true Budo Spirit - Full Contact! Osu!